Over the past decade, the number of Kentuckians who die from drug overdoses has increased to more than 1,500 per year. The drug problem has impacted youth, families and communities like Anderson County, and prompted a local youth group to send out an “S.O.S.” and take action. The Saving Our Students (S.O.S.) Youth Coalition of Anderson County envisions its community of Lawrenceburg, Anderson County, KY, to be an environment and culture for its youths of all ages that is free of alcohol, tobacco, and illicit drugs; and is achieving lasting results and receiving state recognition for their efforts to MAKE A DIFFERENCE. The Saving Our Students (S.O.S.) Youth Coalition of Anderson County was recognized as the 2018 KY Youth Empowerment System (Y.E.S.) Outstanding Achievement Award recipient by the KY Cabinet for Health and Family Services Department for Behavioral Health, Developmental and Intellectual Disabilities and the Bluegrass Prevention Center. 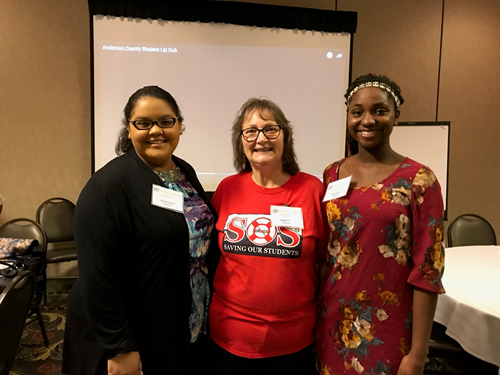 The youth group was honored for their community-based programs to prevent youth substance abuse yesterday, September 26, 2018, during the 11th Annual Kentucky Prevention Network State Conference in Lexington, KY. In addition to this state recognition, the Anderson County Youth Coalition will receive $250 in addition to their existing FY2018 Y.E.S. Grant for youth-led substance abuse prevention strategies in Anderson County. This youth group also received the Y.E.S. Outstanding Achievement Award in 2017, making them the first youth coalition in our state’s history to receive this honor in two consecutive years. The S.O.S. members recognize their fellow students are not immune to the drug problem facing our state and their community. 1 in 8 local 10th grade youth reported first trying alcohol by the age of 10; 1 in 8 reported they had taken a Rx drug without a doctor’s prescription, and 1 in 4 reported drunkenness during the past 30 days according to the 2016 Kentucky Incentives for Prevention Survey in Anderson County. This group’s approach to solving these problems is to engage youth to take the lead to design and implement community-based and peer to peer prevention strategies with hope the anti-drug message will have more of a lasting impact if it delivered by someone who is their age. SOCIAL NORMS CAMPAIGN: The high school youth coalition members implemented a social norms marketing campaign called “The Power of Positivity” reaching 900+ local middle school students in a school assembly. v YOUTH-LED MEDIA OUTREACH: 2,500 students were reached through 3 PSAs and a print media campaign designed by the youth members to show students the dangers of smoking and chewing tobacco, as well as drinking while driving. v A DOSE OF REALITY SCHOOL AND COMMUNITY ASSEMBLIES: 1,300 students were educated about first-time use of alcohol and prescription drug mixtures by a mother who lost 2 sons the same night to the activity. Rebecca Savage of 525 Foundation in Indiana spoke to high school students and adults in the community when she shared her family’s heartbreaking story. v HIDDEN IN PLAIN SIGHT DISPLAY: An interactive educational display of a teenage bedroom was created and shared by the youth coalition with the community. The purpose of the mock bedroom was to educate adults about locations in a teen’s room where alcohol, tobacco or drugs can be hidden from sight and the kinds of everyday items used by youth for drinking, smoking or using drugs. A total of 112 items and locations were identified by S.O.S. members and hidden in plain sight for being found by the adults. v YOUTH LEADERSHIP SUMMIT: A youth summit with youth and community members from Anderson County and surrounding communities was hosted with nationally recognized trainer Joseph Markiewicz to teach the youth how to expand their efforts to prevent/stop youth substance abuse. RETAIL DIRECTED INTERVENTIONS: Coalition members met with business owners of local stores, service stations, and other businesses that sell alcohol and tobacco products to share their personal concerns about underage drinking and smoking/chewing tobacco. The youth designed and provided flyers to the businesses about steps they could take to help their community reduce youth alcohol, tobacco and other drug use. For more information about the S.O.S. Youth Coalition of Anderson County contact Donna Crain Drury at dcdrury@roadrunner.com or 502-517-1938. For more about the Youth Empowerment System (Y.E.S. ), please contact Tara McGuire at tkmcguire@bluegrass.org or 859-225-3296.